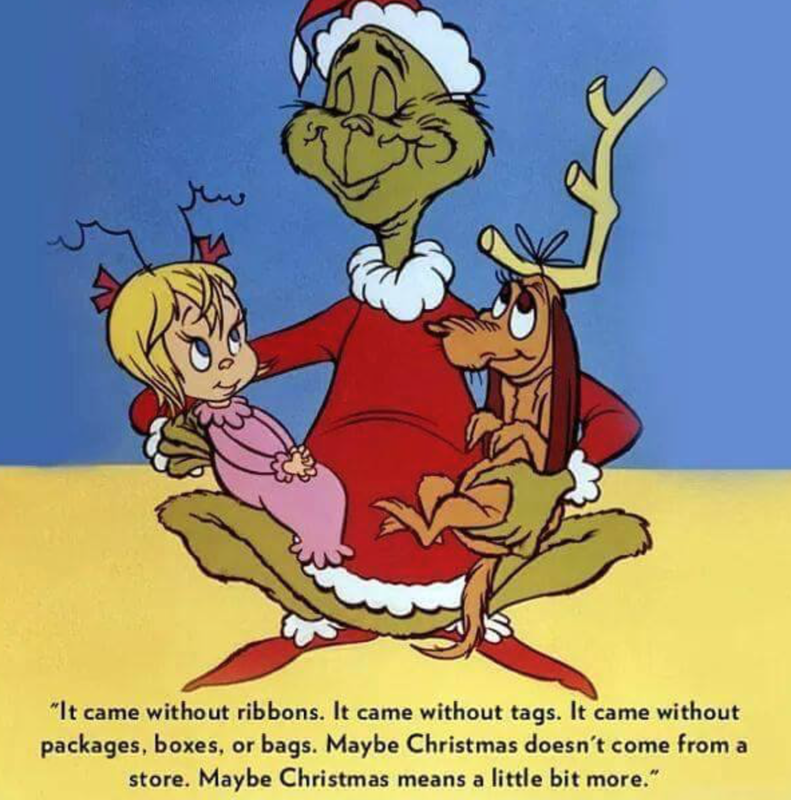 As for second part, the Suess-ie blurb speaks to something that I really believe in – a reminder I want to shout from the Grinch-inhabited hilltops whenever December rolls around. Or maybe just in overcrowded, emotionally-charged retail parking lots. . .
I’m a “giver” so I get the idea of wanting to share with others – it’s a wonderful feeling to give something that we know a person wants or. . .better!…truly needs. At the same time, though…it is not NOT NoT about the gifts. Everyone gets CRAZY around Christmastime. WHY?! People have this immense pressure to buy, buy more, buy again…to wrap and deliver. But that’s not what it’s is about… I feel like I’m always left so baffled. I just mean that this time of year isn’t about throwing material things around, so much as true, sincere giving. I’m not saying I didn’t get gifts as a kid…or that I still don’t. For children, especially, it’s exciting. There are generally rituals built around Christmas morning, and I love seeing happy faces. But there really DOES have to be a point at which it goes overboard. My favorite gift – the one I looked forward to every year – was my red snow shovel. My parents didn’t know that for a long time, but it was the ONE THING I absolutely LOVED getting. I would use it to help my father shovel the driveway…and to me, it therefore well transcended the “material.” It was such a fun event, despite the work involved – the “shovel” represented time we’d spend together, outside, enjoying the snow and fresh air. I don’t think gifts are a “bad” thing, don’t get me wrong. It means a lot to some people to give, and in that way denouncing the whole thing would be denying them something that makes them feel great. What I think is important, though, is that people don’t feel obligated and pressured to buy things. Certainly not “BIG” things. The “holiday spirit” is more about the thoughtfulness above and beyond anything else. And I’ve gotten to a point where time and connection with loved ones, HAPPY loved ones, and health for all of us, is – * yes, really * – all I want. Those things are far more precious to me. The little things, like a random “I love you,” lights up my world with a brilliance no material item could. Life is precious.